Reykjavik is the capital of Iceland, its largest city and, with a latitude at 64°08' N, the world's most northern national capital. It is located in southwestern Iceland, on the southern shore of Faxaflói Bay. With a population of more than 115,000, it is the heart of Iceland's economic and governmental activity. Reykjavík is believed to be the location of the first permanent settlement in Iceland, which Ingólfur Arnarson is said to have established around the year 870. Until the 18th century, there was no urban development in the city location. The city was founded in 1786 as an official trading town and grew steadily over the next decades, as it transformed into a regional and later national center of commerce, population and governmental activities. Today, Reykjavík is the center of the Greater Reykjavík Area which, with a population of more than 190,000, is by far the largest metropolitan area of Iceland. As a highly modernised capital of one of the most developed countries in the world, its inhabitants enjoy first-class welfare system and city infrastructure. Its location, only shortly south of the Arctic Circle, receives only four hours of daylight per day in the depth of winter, and during the summer the nights are almost as bright as the days. This is one of the upcoming tourist destinations and the main attraction is the geothermal pools. Places of tourist attraction include Mt. Keilir, Glymur, Hengill and so on. Reykjavik is one of the most expensive European cities to visit. There are parks, cafes and museums here which attract the tourists. 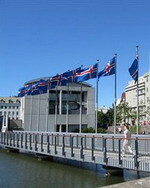 National Museum has many artifacts of the Icelandic and the Norse culture. Austurstraeti and Hafnarstraeti are the two shopping destinations to buy souvenirs and handicrafts. If you are looking for a centrally located hotel and would still prefer peace and privacy, Hotel Bjork is the right choice for you. 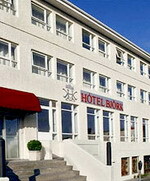 Bjork Hotel is situated within a few minutes walk from Reykjavik city centre and the main shopping street. The main bus terminal Hlemmur is very close as well as the Kringlan shopping mall. The hotel offers 55 spacious and tastefully decorated rooms with numerous modern amenities. Breakfast is served in a restaurant which backs onto the side of the hotel and is reached by a passage off the lobby. A well-equipped business centre with Internet access is available here for guests who are on business purpose. 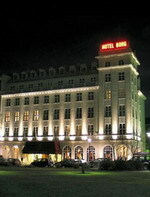 Built in 1930 and restored to its original Art Deco style in 2006, Hotel Borg is a showcase of sophistication. It's an experience in its own right, with character, soul and style. 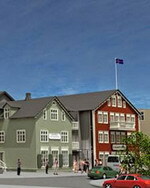 Hotel Borg is exciting blend of traditional and modern that Iceland is famous for. 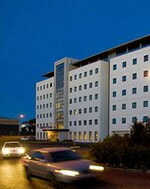 Borg Hotel is located in Reykjavik's Central Square across from the Cathedral and House of Parliament. 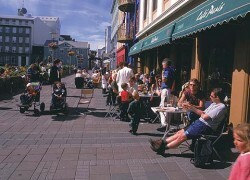 With the main shopping street just around the corner, Reykjavik is on your doorstep. All 56 rooms have custom-made furniture and fittings with modern amenities including flat-screen satellite TV and high-speed Internet connections. For an extra touch of luxury, there are 7 suites and a two-floor Tower Suite with a magnificent 360-degree view. At the Silfur restaurant, you'll find exquisite French cuisine conjured up by an award-winning chef and served in smart surroundings, along with a cafe/bar. Breakfast is served in a separate room in old English style. The Cabin Hotel is well situated at Borgartun, Reykjavik, and has a beautiful view of the bay nearby. Just a short distance away is the city's main shopping area and the bustling downtown cafes and pubs. The Laugardalur fun area, with its excellent swimming pool and other recreational attractions, is also within walking distance of the hotel. Each of the 152 rooms comes equipped with an extensive range of en-suite facilities, including shower/WC, telephone and satellite TV. While many of the rooms offer excellent scenic views, some of them have windows facing directly onto the hotel corridor. This has proved a particularly welcome option among those visitors who have found it difficult to sleep in the brightness of Reykjavik's long summer nights. During leisure, you can explore the city and its surrounding attractions. This hotel is located right in the centre of Reykjavik within a stone's throw of all the lively bars, excellent restaurants and first class shopping. The rooms are very modern and sophisticated with beige and cream decoration and high quality modern furniture. They are in exceptional condition as are the state-of-the-art bathrooms. The breakfast room is also modern and attractive. This hotel comes highly recommended particularly for demanding individual travellers. This hotel really could not be better located, right in the centre of Reykjavik's old town just round the corner from Parliament Square. It could indeed be said that it is located right on the spot where Reykjavik began its history as during the building of the hotel, Archaeological remains were discovered which could well have been part of the original settlement. 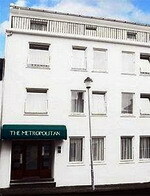 The medium sized rooms are among those of the highest quality in Iceland. They are very modern despite the hotel's traditional exterior. Both the rooms and the bathrooms are in exceptional condition. The restaurant is on the ground floor and combines modern convenience with cosy traditional charm. This is really a magical property constructed with imagination and an eye for detail. Its location and historical provenance are arguably unbeatable. It comes highly recommended. This hotel is located just 5 minutes walk from Reykjavik's main shopping street and is a 40 minutes drive from Keflavik International Airport. Small to medium in size, the rooms are attractively decorated in warm colours and are in good condition as are the bathrooms. The breakfast room is on the ground floor off the lobby. It is decorated in traditional style with dark wood furniture. This simple, friendly hotel represents an ideal base from which to explore Reykjavik. This hotel is located next to the Reykjavik City Airport, the Airport itself is only 5 minutes drive from the centre and services domestic flights. All rooms have been renovated to a high standard and are in very good condition, with light blue and yellow colors to the fore. Rooms are medium in size. The dining room is a quite small area located on the ground floor, an intimate and cozy venue offering seafood dishes as a specialty. The Loftleider is a good, completely renovated product. Some guests may be anxious about the property because of its location but all rooms are well sheltered from aircraft noise - the airport is in fact shut daily from 22:00 hrs until 07:00 hrs. 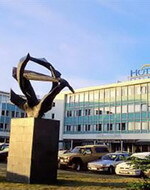 The hotel is suitable base to visit the sights of Reykjavik and is also the first stop for the airport bus "Flybus". 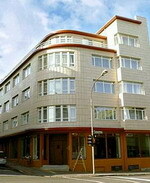 This hotel is located in a narrow side street just 05 min walk from the centre of Reykjavik. The rooms vary in size, but most are small. They are simply decorated in cozy warm colors with good quality, but older furnishings. Both the rooms and the small, basic bathrooms are in very good condition. The breakfast room is located on the ground floor just off the lobby and serves as a seating area during the day. This hotel is perfect for the individual traveler on a budget. It's location couldn't be more practical.